Looking for a neighborhood that is historic, urban and eclectic with a strong sense of community? How about an area that is conveniently located to downtown Saint Paul businesses, and United/Children's Hospitals that is also situated near the Mississippi River and countless restaurants and attractions? A neighborhood that is surrounded by parks and trails, with engage residents working collectively to build a stronger community? The City of Saint Paul's Invest Saint Paul program and the Neighborhood Stabilization Program is investing hundreds of thousands of dollars in the Little Bohemia neighborhood, purchasing and renovated foreclosed and vacated homes that were left abandoned by irresponsible landlords. Most of these homes are large, Victorian or early 20th century houses that are being restored to their former glory. Soon they will placed on the market as single family homes at an affordable cost, and the LBNA encourages you to take a look and consider a sound investment in our neighborhood. The City of Saint Paul is offering financial assistance options for the fully renovated homes in Little Bohemia and other neighborhoods participating in the Invest Saint Paul program. Go to www.stpaulcommunities.com for information on home buyers assistance, eligibility, listings and more information. Four homes have been rehabilitated and sold during the first phase of the project. The following properties are currently being rehabilitated in the Little Bohemia neighborhood, under the management of the Fort Road Federation, which has a long and successful track for projects of the scope and nature. ​Phase 3 of the Fort Road Federation's ISP/NSP plan includes rehabilitation of houses at 326 Harrison Ave, 457 N Smith Ave, and 301 Sturgis Ave beginning the summer of 2016. Check back for progress reports and for full listings once they are available for sale! Fully remodeled two story home in the vibrant West 7th/Fort Road neighborhood! Walk along West 7th Street to Cossetta's, Mancini's, DeGidio's, Bad Weather Brewing, XCEL Energy Center, and everything downtown Saint Paul has to offer. Minutes from the airport and major highways. Brand new HVAC, plumbing, electrical, windows, roof, garage, mechanicals, appliances, etc. Absolutely stunning complete remodel of a historic West 7th/Fort Road home. Beautiful home in a vibrant neighborhood surrounded by amenities. Right next door to the Waldmann(Stone) Saloon, the oldest surviving saloon in MN. Walk along West 7th Street to Cossetta's, Mancini's, DeGidio's, Bad Weather Brewing, XCEL Energy Center, and everything downtown Saint Paul has to offer. New roof, windows, A/C, furnace, kitchen, bathrooms. Fully remodeled shotgun style story and a half in the vibrant West 7th/Fort Road neighborhood. Walk along West 7th Street to Cossetta's, Mancini's, DeGidio's, Bad Weather Brewing, XCEL Energy Center, and everything downtown Saint Paul has to offer. Minutes from the airport and major highways. New roof, windows, A/C, furnace, kitchen, bathrooms. Curb appeal for miles! This is a beautiful brick house that is currently being rehabilitated next to 3 other Inspiring Communities project. Stop by and see the progress that is being made. Will be on the market in the Fall of 2015. This is a neighborhood favorite. Victorian style home will be beautiful when completely rehabbed. Stop by and see the progress that is being made. Will be on the market by the Fall of 2015. 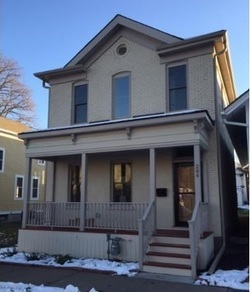 The historic Thauwald house was moved in 2012 to this location from its former home on 384 Smith Ave. The "Thauwald house" will be fully rehabilitated to a new, single-family, three bedroom home.